Take advantage of our limited time sale on select packages, ending soon! 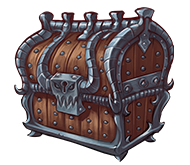 We've made several new content additions to the store, including new crates, bosses, monthlycrates & gkits.. Check them out at the links below. Help us reach our donation goal! We rely on your support to keep the server online and to keep providing exciting and frequent new content. If you wish to seek support, please connect to our Discord. You may expect a response within 30 minutes, to up to 24 hours. Please note that we are not affiliated with Mojang AB in any way. Minecraft is a copyright of Mojang AB. Welcome to the DecimatePVP Store! Here, you can purchase Ranks, Crate Keys, GKits, Bosses, Tags, Unbans, Unmutes, and more. To get started, select a category from the left hand side. Take advantage of any limited time offers by viewing the announcement above or by joining the Discord. Please make sure you are over 18, or consult a parent/legal guardian before making a purchase from our webstore. It may take up to 30 minutes for your purchase to come through. If you run into any issues with your purchase, join our Discord Server and create a new ticket. All responses will be within 24-48 hours. To pay with PaySafeCard, use the PayGol gateway at checkout. Any purchase made with eChecks may take up to 7-14 days to clear.